I now need some batteries to run in it and a charger for them. I have never purchased or used 18650’s before but have heard the usual collection of stories about them blowing up and catching fire so am keen to proceed cautiously. It seems that ‘protected’ cells are the way to go, with a decent charger. What does anyone on here recommend? I need it to plug into the mains (UK) although a USB charger may be OK. I need two batteries and I need to be able to plug them in and leave them to charge unattended – possibly while I am not in the house, possibly for several days. All advice very welcome, thanks! you never told us your budget.. Thanks. No, I didn’t mention budget … perhaps I should have done. Maybe I can answer your post with a question: given that I want safe batteries and a safe charger, what should I look at spending and what do I get for spending more? Have that light and can tell you it’s a great light but you will need to use unprotected batteries and they need to be on the short side. Any battery from Panasonic, Sanyo, Samsung, Sony, or LG would work in that light. I would read some battery reviews and pick one on the short side. The guy doing those reviews is “HKJ” a member of this forum and an expert batteries and chargers. Opus, Nitecore, and Xtar(unreliable in my experience) are some of the more popular brands of chargers. For some reason none of the links to HKJ’s review site are working so I removed them. Search “HKJ battery review” and you should be able to find the site. I’d be very happy to pay the extra £2 for peace of mind. What other charger options are there? Protected batteries will not work in that light, too long. Battery you need depends on your use. Lithium-ion batteries have many variants, but I will briefly explains the most common formats quickly. ICR – this cell uses lithium cobalt and is the most common. Also provides the highest capacity but is the least safest. INR – this cell uses lithium manganese and can provide very high discharge currents needed for insanely bright flashlights and is a bit more safer than ICR. IFR – this cell uses lithium iron and is the safest lithium ion battery available but it’s nominal voltage is lower so is it’s capacity, being the lowest. For your need ICR will be more than enough since your flashlight draws only about 3-4 amps and the cell can provide it with no issues. However if you mod your flashlight with higher power components you will need to invest in an INR cell. These cells are safe when used with care (your cellphone battery is ICR). If safety is that important to you then you can use an IFR cell but will have to sacrifice runtime. Charger you should buy a decent one although even cheap chargers do the job. Good chargers will cut-off charging once it detects that the cell is full so it is safe to leave them in the charger while you’re away. Now to answer your question – what should I look at spending and what do I get for spending more? Buy batteries from reputed sellers and brands so that not only will you get genuine cells but also the stated capacity. The market is flooded with fake cells and fake advertised cells. As a general rule of thumb keep away from anything that has the name fire on it (eg; Ultrafire , Trustfire). Buy chargers from reputed sellers and brands because the same problem I mentioned above exists here too. If you will only use those two 18650s then just get the basic model. Fancy models offer charging multiple types of battery chemistries, set charge current, use as powerbank etc. 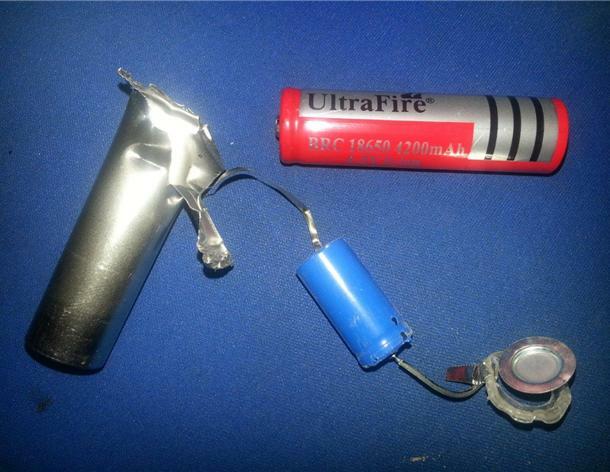 Like others said, protected batteries have a protection circuit board attached to the battery making it a bit longer and may not fit inside all flashlights. As for unprotected batteries it doesn’t matter as long as the charger and the device which uses your battery have protection feature built-in. keep an eye out for sales on this charger .It goes for anywhere between 15$ to 20$ pretty regularly . Brilliant, thanks for the help. Particularly Southland, with first-hand experience of the light in question. OK, so the advice is to buy a reputable-brand unprotected 18650 from a good seller (does Amazon count?) and a decent charger and all should be fine. That’s all easy enough. Unfortunately Amazon doesn’t sell everything themselves, most of them are listings by other sellers using Amazon. Some of them might be selling counterfeits, though not always on purpose. About the “Fire”, I meant that for batteries and chargers. Thorfire is a good brand making decent flashlights. This thread here tells you to stay away from certain sellers who are known to sell fakes. Thorfire is a middle of the road light, pretty good for the money. Oops, all my talk about the light not taking a long battery was about the TK15, not the VG15. Not sure about the dimensions of the VG15. They look the same except the TK15 has a side switch. Thanks for your comments. I ended up buying two Panasonic NCR18650B cells and an XTAR VC2 charger. Both were available on next-day delivery from Amazon and the cells seemed to get a good write-up on this site. I don’t know whether the cells are genuine or not but the seller seemed to get excellent reviews on Amazon (for what it’s worth). Lexel, your comments are helpful. It seems that the charger DOES have over-charge protection and the torch DOES have a low voltage cut-off, so I guess I should be OK on both of those fronts. I will still be nervous about both charging the batteries and using the torch for a while however. I am guessing that 18650’s are always supplied in a little plastic case to protect them and that damaging the plastic sleeving can cause them to fail quite destructively? Don’t be nervous about using 18650 batteries. Most of the disasters you read about are the result of somebody shorting the battery such as carrying it in their pocket with a bunch of loose change. That’s just stupidity. The Panasonic 18650B batteries I bought also came in a plastic case surrounded in foam and in an outer box. That’s to meet shipping requirements here in the US if they are sent by US Postal Service mail. I have received a bunch from overseas where the batteries were shrink wrapped in plastic to prevent shorting and just over-wrapped in Styrofoam inside a plastic bag. Those came by USPS too after reaching the US. I like the Panasonic batteries because they are an honest 3400 mAh rating for the ones I bought for $11.50 a pair recently. I also own quite a few batteries with overly optimistic ratings and names like Trustfire and Ultrafire. I did a quick comparison of three batteries, the Panasonic 3400 mAh, Ultrafire “4000” mAh, and Ultrafire “5800” mAh. If you simply weigh the batteries, the batteries were 45.6 grams, 35.7 grams, and 28.4 grams respectively. That should arouse some suspicion since the battery with the greatest mAhs should be the heaviest. I put pairs of these in a dual CREE XPE bike headlight and ran it on flashing mode until the monitoring lights showed it was nearly depleted (four indicators down to one indicator). The Panasonic batteries ran the light over 13 hours and 28 minutes while the “5800” mAh Ultrafire battery lasted 2 hours and 4 minutes and the “4000” mAh battery lasted 3 hours and 20 minutes. When I want an assured long run time I use the Panasonic batteries but still will use the Trustfire and Ultrafire batteries for those times when a long run time is not an issue. The Panasonic batteries are about four times as expensive as the cheap Chinese batteries so if I need a bunch of batteries for a non essential use it still makes sense to use the Chinese batteries but when I buy new ones I will choose the ones with a modest rating and hope for the best. I have given away a bunch of the inexpensive Trustfire XML-T6 flashlights to friends in past Christmases and only once had one brought back because the tail switch quit working on it. I use them myself too. They are hard to beat as a practical and inexpensive gift especially when you give the recipient a pair of batteries and basic charger to go along with it. No complaints so far and lots of positive comments.. Saw that you got some panny-Bs… good choice. Nice capacity, and they can handle up to I think 5A or so, more than enough for a tubelight. Chargers, I don’t have any Xtars, but nice and cheap chargers are the LiitoKalas. I got 100s and 202s. Nitecore chargers are nice (got an i2), as are Opus (BC3100). That said, N E V E R leave Li cells charging unattended. Don’t go to the can, let alone leave them unattended for days. If the charging circuitry is good then you can. Even with the best, you can be the lucky 1 in 1E6 to get a lemon. If luck is added into any situation then the possibilities are endless. Thanks for the comments. The batteries arrived yesterday and I charged them. The charger is a clever thing and showed (or appeared to show) the amount of charge put into each battery. It got to 2486mAh (I think) before saying “Full” for each battery. However I am suspicious of this as I took one battery out after about 10 minutes to see if it reset and it did, and started counting again from zero but still got to the same number as the other one. Another point; I have an old Romisen RC-N3 torch which has broken, hence the new one and the new batteries. The Romisen ran on a pair of Eneloops, and I was looking at them again last night and saw that they claim a minimum capacity of 1900mAh. 2×1900 = 3800mAh, which is more than the capacity of one of the NCR18650B’s that I have just purchased. If this is the case then what’s so great about 18650’s? N series AAA/AA 1900mAH pack will have Nx1,2 voltage and 1900 mAH capacity . N parallel AAA/AA 1900mAH pack will have Nx1900mAH capacity and 1,2 V voltage . If this is the case then what’s so great about 18650’s? This whole thing would be a lot less confusing if you compare batteries using “Wh” instead of “mAh”. So you can easily see that a single 18650 has almost 3 times the energy than two eneloops combined. Ah yes, thanks – that was a stupid question that I asked, wasn’t it! OK, back to the question about charging those 18650’s; would you have expected the charger to give exactly the same number of mAh for both given that one of them was reset after 10 minutes or so? The average voltage output of any given battery depends on the shape of its discharge curves and the amount of load resistance at its terminals versus its own resistance, i.e. the lesser the load resistance (bigger load) the lower the voltage applied to it gets. Typical (average) nominal voltages are low load figures. On top of this, the shape of the discharge curve matters. As a little example I can say Panasonic NCR18650B cells hold good low voltage capacity whereas Samsung 26F cells don't, this means the effective average voltage is higher for 26Fs. To say it in other words, when the 26Fs give up the NCR18650Bs keep going for a bit longer. Real 0.2C capacity down to 2.8V is 3200+mAh for NCR18650Bs and 2550+mAh for 26Fs. For higher load scenarios grab high discharge cells. Your Panasonics can handle up to 7A I believe but that is forcing the machine, if you need to draw more than 5A out of them my advice is to switch to high discharge cells (VTC5s, HG2s, 30Qs, etc). I think the 30Q is the best choice at the moment, but i think HG2 is very similar. But with those you have a high 3000mAh capacity and high discharge current (rated 20 Amperes iirc)in one cell. They’re not expensive either. I recently got 4 for like $12.95. Mooch tested the VTC5A and his conclusion was “a fantastic 25A battery”. In HKJ's tests it made up to 30A continuous. This same pattern can be seen with the newer Vapcell 2000mAh 38A, Mooch rated it 30A and in HKJ's test it did 30A without being excessively close to the maximum allowable temperature. This is likely due to differences in temperature probe positioning, I believe. What happens when a battery is drained at a higher-than-its-specified current rating? Eg. you mentioned the (unprotected) Panasonic NCR18650B at 7A, what if its (attempted) being drained at 9 or 10A? Will it not be able to give that much amps? or the capacity will be significantly lower? or it heats up too much and could become dangerous? or lowers the life cycle significantly? Draining a battery/cell above its maximum continuous rating can result in overheating, output voltage, capacity & energy output reduction/plummeting and of course lesser cycle life. Basically all of what you mentioned above, d_t_a. Just stumbled upon this thread looking back on my list of messages. Quick update to this. I have now used the whizz-bang new torch a few times in anger, including several times as a bike light. Observations are that it is extremely bright – possibly too bright to use (in flashing mode) as a bike light as it risks dazzling other road users, although I angle it down to a point about 10metres in front of the bike and it’s just about OK. I am still on the first charge of the first battery, despite quite a lot of use! It seems that the capacity of the 18650’s is way, way ahead of that of a pair of AA eneloops. Thanks again for your help. A new torch and some modern batteries was never going to change my life and it hasn’t (! ), but it’s a good thing to have. It can’t maintain the voltage, you get serious voltage sag. This is because of the high internal resistance of low drain (high capacity) cells like the Panasonic 18650B. In fact, it’s best to use them up to 3 Amperes i.m.o. to avoid voltage sag. Go above the max. rated current and a considerable amount of energy will be dissipated inside the cell, the cell will get warm or hot. Sanyo 18650-GA 3500 mah/10A is a very good all around battery for many lights you’re certainly going to purchase after you get a taste of units putting out over 1,000 lumen (actual). LiitoKala make very good chargers for a very low price. A step up is Xtar. Look for Gearbest coupon codes on this page from Gearbest. BTW, I am not sure what you paid for the thorfire but Zanflare makes the F1, a single 18650 EDC light that’s 1240 lumens. It can be had for $20 shipped and as low as $10 on flash deals. Two button controls and on-board charging. It can’t be beat for under $20. Nitecore now makes the EDC23 that’s 1800 lumens and is the same size and form…. ‘Just a little fuel for the addiction. light addict....yeah I've got the bug. Sanyo 18650-GA 3500 mah/10A is a very good all around battery for many lights you’re certainly going to purchase after you get a taste of units putting out over 1,000 lumen (actual). LiitoKala make very good chargers for a very low price. A step up is Xtar. Look for Gearbest coupon codes on this page from Gearbest. BTW, I am not sure what you paid for the thorfire but Zanflare makes the F1, a single 18650 EDC light that’s 1240 lumens. It can be had for $20 shipped and as low as $10 on flash deals. Two button controls and on-board charging. It can’t be beat for under $20. Nitecore now makes the EDC23 that’s 1800 lumens and is the same size and form…. ‘Just a little fuel for the addiction. Agree with the NCR18650GA as a great all around battery. Do you think flat tops or button tops are more universally compatible?